Review: An exhibition explores the surprisingly fluid interchange between Late Roman and Early Christian art. Civilizations and cultures don't begin or end neatly, like chapters in an elementary-school history book. They borrow and blur, taking time to transition from one to another, often coexisting for a long time. 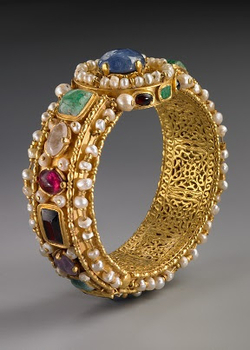 That is the theme of "Glorious Splendor: Treasures of Early Christian Art" at the Toledo Museum of Art. It aims to illustrate that the art of the first several centuries after the death of Christ shared much with its predecessors—in materials, methods, iconographies and styles—and thus to demonstrate that the Roman empire did not abruptly turn Christian when Constantine became the first Roman emperor to convert in A.D. 337. A bit oddly, the exhibition undercuts its title (which was probably driven by marketing goals) and a bit of its thesis. About two-thirds of the 28 works here either are secular objects, like jewelry or imperial items, or honor pagan gods, like Jupiter and Aphrodite. Moreover, the earliest Christian object—a glass fragment, with gold leaf, showing Christ giving the law to Ss. Peter and Paul—was made in the late fourth century, decades after Constantine's death and long after Christianity started to take root in Rome, spawning Christian art. In other words, the exhibition's span is bigger, the content broader, and the thesis less clearly shown than one might expect. Still, once visitors lean in to enjoy the precious objects on view ("lean in" because many are quite small and are best seen up close, preferably through the monoculars provided by the museum), they will find much to admire. All but two of the pieces are borrowed from private collections, many have never before been shown in a museum, and who knows when the public will have an opportunity to see them again? Visually, that "glorious splendor" is most obvious in the many gold objects—such as a "Gold Brooch in the Shape of a Facing Lion's Head" (second century B.C.). Because of the chasing—the incisions made by a sharp chisel to create detail and texture—that defines the cat's whiskers, nostrils, eyes and mane, it sparkles more brightly than many jeweled pieces here, including two bulky but beautiful "Gold Openwork Bracelets Set With Gems and Pearls" (sixth century). Near the lion hangs a counterpart "Gold Pendant With the Bust of an Archangel" (sixth-early seventh century), also a repoussé relief (made by hammering the metal from behind) and also marked by chasing, which in this case highlights the angel's wings, cheekbones and draped clothing. Continuing his continuity theme, curator Adam Levine has juxtaposed the angel with two cameos, one of which—"Sardonyx Cameo Depicting the Annunciation in a Mount Ornamented With Pearls on a Gold Chain" (sixth century)—helps identify the angel in the gold relief as Gabriel. That is because his hand is raised in a similar gesture in both images. Other impressive gold pieces range from a rare "Gold Bust of Licinius II " (317-24), to a heavy "Gold Pendant With the Capitoline Triad" (second century), which could have been worn by a pagan priest, to a delicate "Gold Pendant Cross With Openwork Decoration and Sapphires" (sixth-early seventh century). The exhibition's five cameos and two intaglios (with the design incised rather than cut in relief), which are carved in red jasper, garnet and amethyst as well as sardonyx, date from the second century B.C. to the sixth. Even as it suggests the long interest in cameos and the formulaic composition—a couple of inches in a hard medium leaves little room for experimentation—the span illustrates changes in style: sometimes naturalistic, sometimes not. 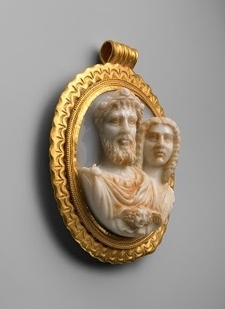 In terms of craftsmanship, those in high relief—"Sardonyx Cameo Busts of Septimius Severus and Julia Domna" (c. 207-211), a dual portrait of the emperor and his second wife in an oval less than two inches long, and "Amethyst Cameo Bust of Faustina the Younger" (c. 161-180)—seem bound to catch visitors' attention. Completely different is "Silver Paten Depicting the Communion of the Apostles" (547-50). This circular plate, Mr. Levine says, is the earliest known example of this scene, which is not the Last Supper (it includes the apostle Paul, for example, who was not present then). It shows in metalwork relief, with gilt highlights, two figures of Christ, one distributing bread and the other wine, from an altar. This conception, seen mainly in the Church's Eastern Orthodox rites, may reflect disagreements in the early days of Christianity as to whether Jesus was one person, with both divine and human natures, or two. The design here shows the blending of cultures in that the ceremony is enclosed in columns supporting a canopy—elements of a pagan temple evolving into a nave. 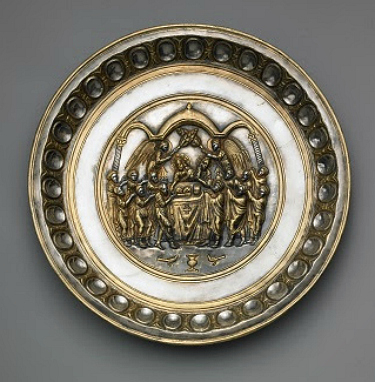 As such, the paten, which was used in the celebration of the Eucharist, can be seen as the incarnation of the exhibition's theme—an excellent example of early Christian art. "Glorious Splendor" is wondrous to look at, but it places too big a burden on the few objects that epitomize its theme.